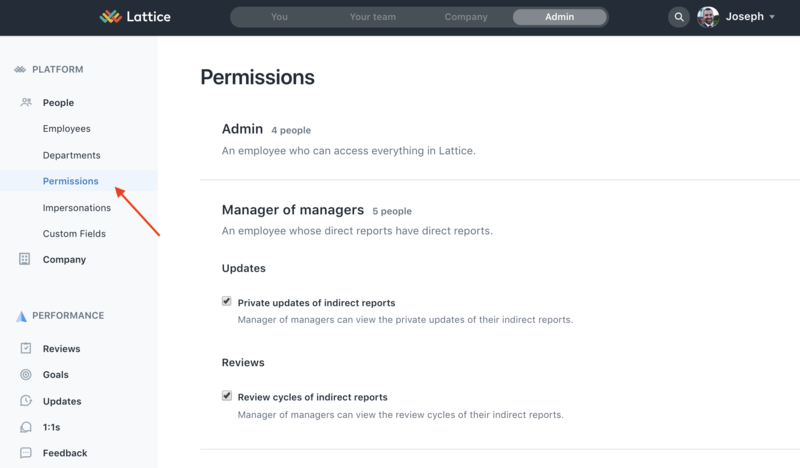 Admins of Lattice always have full visibility into all feedback written for each review cycle within the company. Managers can see the feedback given to their direct reports during a review cycle. Depending on the needs of the organization, admins can configure whether or not a manager of managers can see feedback from their indirect reports' performance review as well. By default, Taylor can see the feedback given to Susan from a review cycle. Tiffany can see the feedback given to Samantha and Sarah. Checking the box allows Alice to also read the feedback given to Susan, Samantha, and Sarah. Managers of managers can go to the user profile of the employee that they wish to see review results for and click on the review cycle they want to view under the "Review" section. Only ended review cycles will be visible.